In the pursuit to satisfy even the very bottom of the "hierarchy of human needs", as the Maslow Theory goes, we Filipinos have failed. The basic needs for food, shelter, etc. have not been met for majority of the citizenry. A society, that community of people comprising the state, which in turn is administered/ruled by a government. In our homeland's case, that society has been and is suffering for so long. Then and now, there has been endless talk of who should rule the country, what should the form of government be, how should we change the government (form, leadership, institutions, etc.). We are going in circles, vicious circles at that because, if we stand back and think, we will find that the society, the nation, the homeland, the people, is in a cage, imprisoned in an invisible cage, free to roam fly, talk, walk but only... inside the cage. The cage is our unquestioned political and economic systems built for us by our former American masters, inherited unquestioningly and redesigned consciously by our landed aristocracy to fit their own selfish desires to maintain and expand their economic and political power; modified and rationalized by our westernized technocrats to serve their local and foreign sponsors/masters; perpetuated by past and present national leaderships to serve their personal ambitions for wealth and power -- with the help of the low-profiled, but extremely and financially powerful Chinoy businessmen (who do not really see themselves as Filipinos, thus unconcerned about the poor natives, especially now that the Chinese mainland has become capitalistic and a global power); all laughing their way to the banks. And finally, a cage strengthened by the similarly corrupt, American-conditioned/trained leadership in the Armed Forces who are bent on participating in and defending their newly found source of illegal wealth. These ruling elite and their military cohorts, thanks partly to their American anti-communist (now as "anti-terrorist") conditioning, seeing and labeling human rights activists and those who preach authentic Christianity, i.e. "loving your neighbor" = respect and care for the poor, as "communists/terrorist" and thus having them harassed, intimidated and murdered (we can call these acts by military/paramilitary forces as"state-sponsored terrorism"). So that these ruling elites and cohorts, can perpetuate their hold on power and wealth, and all the while greedily lick their chops. We are reminded of what the late Brazilian Bishop Dom Helder Camara said about the Brazilian ruling elite and its successive military dictatorships/regimes :‘I helped the poor and they called me a saint, I asked why they were poor and they called me a Communist.’But in our homeland, this cage is allowed by most in the powerful Church and among its churchgoers, Catholic-Protestant-Evangelicals-Pentecostals-what have you, forgetting ,even laughing about what authentic christianity is-- granting they knew what their proclaimed christianity is to begin with -- becoming part of the defenders of the status quo, by being in the sidelines or turning a blind eye to such since they are OK ("Games People Play": Am OK, I don't care if you're not OK); the churchmen promising the heavens in the hereafter to the suffering majority, the rich and middle classes, and those who are comfortably residing abroad reinforcing these stupidities to themselves and the poor and ignorant people to accept the latter's suffering as "God-ordained". And so the poor sheepishly accept their "fate" - giving validity to Karl Marx's oft-quoted maxim: “Religion is the sigh of the oppressed people, the heart of the heartless world, and the soul of the soulless conditions, it is the opium of the people.” In effect, the Church has become part of the cage, through our captive, herdlike minds. With all these enemies of the impoverished people, the powerless citizenry, the ignorant mass is condemned to scrounge and fool its equals; and with such role-models, to emulate the greedy ways of thinking and behaving of its rulers (and wanna-bes) in its own little way. The nation, the homeland, the Filipinos in the Philippines are in a deep quagmire (a quicksand may be more appropriate). Despite its well-known natural wealth, its fertile land, its precious mines, its dense forests, its rivers and lakes abundant with fish, etc. the majority of its people have only experienced deepening and perpetual poverty, where early death seems to be the only blessing. And the nation and people have lost and continually lose much of its natural wealth, its forests, its gold, silver, copper, chromium -- all either not renewed as the forests or non-renewable as the mines. All these losses in our national patrimony replaced by erosion and flooding, the mining wastes poisoning to death its rivers, lakes, fishes and people, all these destructions for posterity courtesy of the unconscionable local and foreign businessmen/corporations, in cahoots with the national bureaucrats, rationalized by our foreign-trained technocrats, and bulldozed by the military. Many of them participants in the destruction and assassinations/killings being so-called Catholics with only insatiable greed in their minds and hearts. Talk economics to me, about free-trade, WTO, foreign investments, capitalism, privatization, more exports, Green Revolution, ad nauseam. Talk political systems: about political democracy, a bilateral Congress, an Executive branch, a Judiciary, ad nauseam. Talk about a need for the parliamentary system, an authoritarian ruler, education, discipline, people power, Yellow Revolution (19 years ago, not a revolution at all, a people duped and leadership turned yellow instead, thus wasting the best and last, possibly peaceful opportunity for fundamental changes), an educated leadership, an uneducated leadership, a celebrity leadership, ad nauseam. All these our people have seen, have done. We have gladly and literally prostituted our homeland, our patrimony, our women and children, our posterity condemned -all these for decades and we have nothing to show for our poor majority. All these a charade, a musical chair, an entertainment, a fool's game and the citizens are the fooled one, and for so, so long. Economic deterioration, political deterioration. Ingredients for revolution. 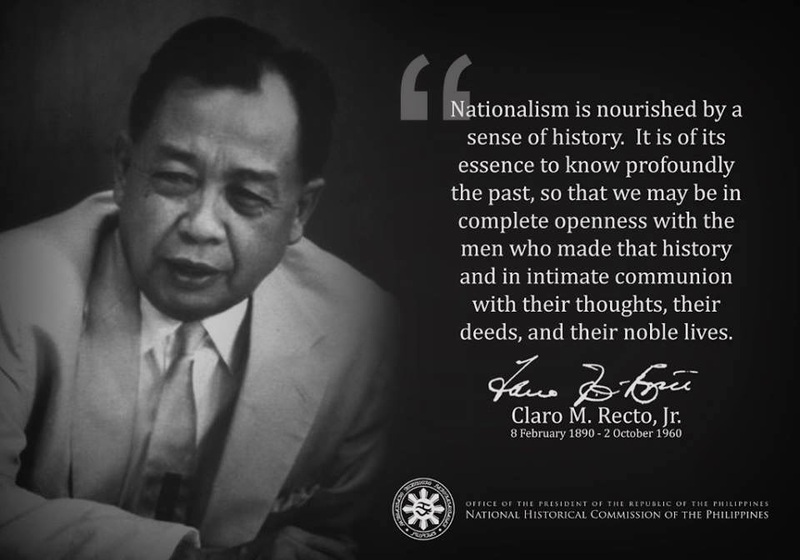 We, most specially the Filipinos in the Philippines (while those abroad can similarly do so and pass along information), have to seriously inquire, have to study and know, understand and learn from our nationalist history (and 3rd world history); that in this case we Filipinos have to realize that ignorance is not bliss, have to face the truth and have to act, hopefully in our lifetimes, to destroy this cage. And offer a new beginning for the next generations. To those self-proclaimed Christians who are wealthy, comfortable -in the homeland and abroad- but miserly selfish and/or greedy: I quote St. Basil who put in the mouths of the privileged men of his own day: "We receive and we give not to others. We praise generosity, but we deprive the poor of it. We are freed slaves, but we do not pity our companions who remain under the yoke. We were hungry, and now have a surfeit of possessions, but we ignore the needy. While we have God as a magnificent patron and provider, we have been stingy towards the poor and refuse to share the goods with them. Our sheep are fruitful, but more numerous are the people who go naked. Our barns are too small to contain all that we possess and yet we do not pity those who anguish." A wishful thought: When the so-called Catholic Christians in our homeland come to a fuller realization of the demands made by their doctrine in the light of our people's position today, the cries of their consciences can lead to work for the "common good." Hopefully the time, much past due, for their action will come sooner and to fruition.